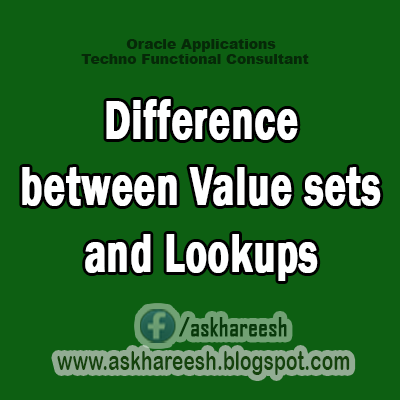 Value sets and Lookups might look similar and confuse some people but there are some basic differences between the two. Valuesets can be attached to parameters of a concurrent program. Lookups can n’t be attached to parameters of a concurrent program. Value Sets are almost never maintained by end users, with the exception of GL Flexfield codes. Lookups are maintainable by the users. Value sets are usually maintained by System Administrators. HR Users will maintain "Ethnic Minority" lookups. Value sets can contain values that are a result of an SQL Statement. Hence it is possible to make Value Set list of values dynamic. Lookup Codes are Static list of values.